Ken Njoroge is the CEO and co-founder of Cellulant Corporation, a Nairobi-based company that builds and operates mobile commerce networks; and offers services such as mobile banking, merchant payments, web payments, digital content, and agency banking services. It serves banks, merchants, and network operators in Africa. However, one situation stands out because of the enduring lesson it taught me. It was back in 2004, in the early days of our company, we had just successfully convinced Dr Samuel Kiruthu to serve as our board chair, a position which he holds to date. Though he believed in our vision and was enthused by the passion of our then small team, he used the first-ever board meeting to interrogate our financials, which, at the time, were not in the best of conditions. It was an excruciating meeting, but it served as a powerful lesson. Early on, I realised that a business is not a hobby. People had staked their entire careers and reputations on us, and we could not let them down. More than a decade later, I am still grateful for the tough board meeting in 2004: it toughened us up and gave us the drive to build a world-class business with a proper governance framework, market-driven products and a strong commitment to Africa. It has to be the people we have managed to rally behind our vision of building a world-class business in Africa, for Africans, by Africans. Nurturing talent is one thing, but bringing people together behind a bold vision while promoting values such as integrity, passion, and belief in the possibility of things, is another altogether. Though it has not been easy, it has been fulfilling. 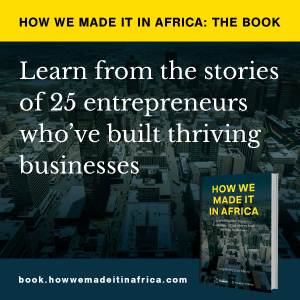 We have created a strong corporate culture that acts as a counterculture to many of the elements that we are trying to rid ourselves of in Africa. Right from the outset, we have adopted a strong stance against bribes. We believe that innovation wins the day, not bribes. We work with the most innovative and talented entrepreneurs across the continent. I always say that everyone at Cellulant is an entrepreneur. That is part of our DNA. I remember back in 2008, when we were expanding our mobile banking solutions after securing business with some of the largest banks across Africa; we entrusted entire markets to young project managers and charged them with the responsibility of building the business in those markets while staying true to our values and identity. To the naked eye, this seemed like a huge risk, but, for me, it was not. I trusted them. This trust has not been in vain. Today, we are the largest payments company in Africa, reaching more than 40 million people with our products. We have a presence in 11 markets and service 34 countries in Africa. These milestones are the result of the commitment, industry and genius of our people. Invest in people and the success will follow. About four years into the business, I had roughly 20 people reporting to me. This was nice in a way because it allowed me to have visibility around all the things that were going on in the business. When you have a flat reporting structure, it is easy to cave into the temptation of grabbing the ball and running with it yourself. This can be dangerous, however, when you are growing, and more people are joining the business. Sometime in 2010, I realised that I needed to change my management style. Essentially, what had happened with the business is that we had gone through the first three years of near-death experiences and then gone into this phase of rapid growth. We were focused on growth and stretching people, and I realised that when I looked in people’s eyes, they could understand where we were going, but I was not connecting. I got a consulting firm to help me figure out the problem. At the end of the study, a bunch of all the problems that we were seeing generally had something to do with the way I was managing and engaging with the teams. I was imposing deadlines, I was driving strategic change, without taking time to explain to people what it meant, and completely intolerant of dissent. I knew I needed to change that. My managing style was causing a problem because the business was getting to a certain scale, where the types of people who were running responsibilities wanted to be listened to, had a point of view and, to be quite honest, had a lot to bring to the game. So that meant I needed to be patient, I needed to be consultative and I needed to take time to explain to people why we needed to do certain things or go in a certain way. By being conscious about how I was leading, I was able to learn being patient and focusing more on coaching people through their work and projects. Every time I speak to young entrepreneurs, there are three pieces of advice that I generally do not agree with. Follow your dreams: this is probably the most popular advice given to young people nowadays. However, your dreams can only take you so far. Following your dreams is great only when you are solving the right problem, at the right time. Otherwise, you are inviting high stress levels for a dream that could have been achieved by learning from those who are progressing in building great businesses. Find something unique for your business idea: in this day and age, the adage, “there is nothing new under the sun”, rings true. It’s not a new idea that wins, but the execution. Find a new approach, solve the right problem. Success as an indicator that you have arrived is dangerous: this is not so much a piece of advice, but a pitfall for every entrepreneur to watch out for. Success can seduce even the smartest people to think that they are unbeatable, which, in return, leads them to relax and lose the focus that they need to continue growing. Entrepreneurship is a journey, not a destination. When we started out, Bolaji Akinboro, my co-founder, and I were convinced that we would build a successful, high-growth business and retire within 10 years, which, by our calculation, would be between 2013-2014. However, this has not come to pass. Today, I am busier than I have ever been in my career. We have just secured a record-setting investment and we need to reinforce that can-do attitude in order to deliver return on this investment. Our investors have made big commitments, but they also have big expectations. They are banking on us to accelerate the company’s growth and position the business as an African success story on the global stage. I have seen firsthand how digital financial empowerment can transform lives across Africa and want to do more. The Africa Rising narrative is still alive, but a lot still needs to be done on the financial inclusion front. Two thirds of the population across the continent is still locked out of the financial system, despite the widespread mobile revolution that has put mobile phones in the hands of at least 700 million Africans. We see this mobile penetration as a huge opportunity to bring financial services closer to millions of people through our solutions, but also realise that more partnerships will be needed, more meetings, presentations, more investments – in other words, more work. That is why I reiterate that entrepreneurship is a journey; it is a lifetime commitment. I wish I knew this when I started out. If I did, would I change my mind? Never. I would be an entrepreneur a thousand times over. I cherish each and every experience, especially the ones that have helped me contribute to Africa’s development. I strongly believe that the 21st century is the African century. Now is our time. 6 Name a business opportunity you would still like to pursue. In a continent such as ours, there are myriad untapped business opportunities in all sectors: it really depends on your approach. However, one that stands out is energy because of the sheer need across Africa. Increasing off- and on-grid electricity presents roughly a $4.5bn opportunity. Today, roughly two out of five people have access to reliable power daily. This essentially means that 70% of Africans do not have access to power. There are several ways to approach solving this problem, including the use of fintech. Someone looking to solve this problem should be asking themselves how to scale services such as access to pay-as-you-go energy from the current one million users to 100 million users in the next five years.